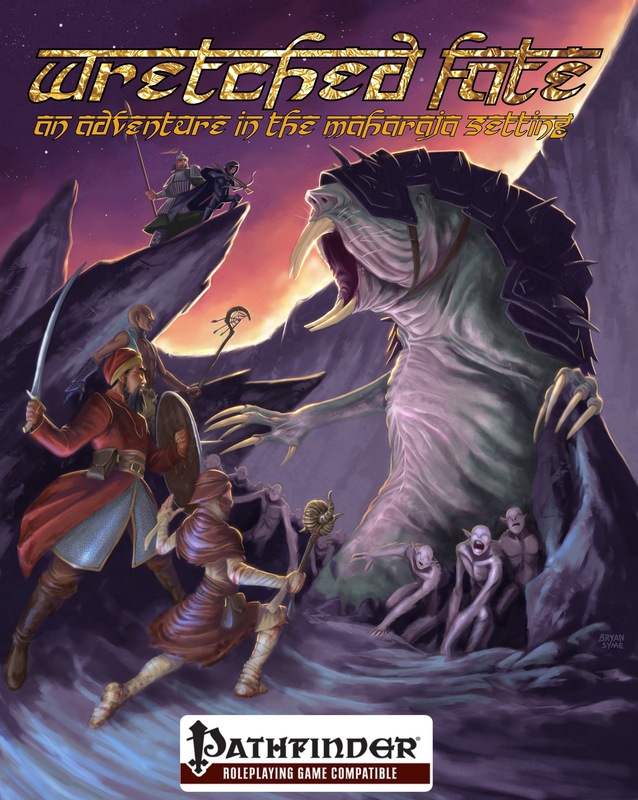 "Wretched Fate" is a Pathfinder Roleplaying Game compatible adventure for four to six players of levels 7-9. The adventure begins on the road into a dusty and barren north western province of the land of Naya Aadesh, the arid Maksharif. This dry region suffers under yearly droughts, making the area prone to terrible dust storms and times of thirst. Cities and villages along the border have weathered these harsh conditions, but things have become worse, and it has been months since tidings have been heard from the border town of Alimak. As the Autumn sun sets over Maksharif, the beleaguered town remains isolated, it's wretched fate unknown. Worse still, travelers have come to the capital of the region, bearing ill news. They report that upon passing through Alimak, they observed that the peasants in the area are carrying arms, and also that contrary to custom, the local Kshatriya lord was unavailable to grant them audience and passage. The local Raja has commanded the Rajanni adventurers to respond to this, and find out if the town has fallen to slavers, is in open revolt, or worse. The heroes must investigate and subdue any evil that may be brewing in the desperate desolate borderlands. Now available (and welcome Malachite Quills Publishing)!